We’ve been patiently waiting for BioShock Infinite for a couple of years now. It won “Best of Show” at E3 in 2011, and was originally slated for an October 2012 release. Unfortunately it was delayed until 2013 – but March 26 is just around the corner. The game is set in 1912, and although it is the third installment in the Bioshock franchise – it is not a sequel or prequel. Instead of the story taking place in an underwater city, BioShock Infinate takes place in a floating air-city of Columbia. Reviews are yet to be released for the highly anticipated game, but should be expected in the next week or so. Hopefully the game can live up to all of the hype. XBOX 360, PS3 and PC Versions will all be released on March 26, 2013. 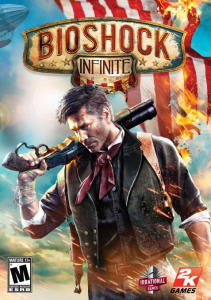 If you pre-order BioShock Infinite on Amazon, you will receive $30 worth of 2K Games credit upon release, plus “BioShock Infinite: Mind in Revolt” for Kindle and the “Industrial Revolution Pack” free. Click here for details.